I have been forecasting financial asset prices for 40 years. One of my most important jobs, as Chief Market Strategist of Asbury Research and Asbury Investment Management (AIM), is to constantly evaluate and re-evaluate the current level of risk in the stock market — because it’s always changing. One of the ways I do this is by closely tracking a short list of my favorite stock market internals. These stock market internals, which are non-price based metrics, have become essential in managing portfolio risk because of how significantly the participation in the stock market has changed within just the past decade. Specifically, 70% of overall daily trading volume is now generated by algorithmic trading. And, in my opinion, a lot of these “algos” are specifically designed to “push our buttons”. That is, to use our emotions as human beings against us — in a kind of financial jiu jitsu — to do precisely the wrong thing at the wrong time, like buying at market tops and selling at market bottoms. This is accomplished by large sums of algo-driven assets pushing key indexes, or influential stocks, back and forth through important key technical price levels that investors and the financial press are focusing on, which can include previous market highs or lows, technical trend lines, and popular moving averages. Unlike stock market indexes, which are one-dimensional in that they simply indicate the average price of a certain group of stocks, market internals reveal what’s happening “under the hood” of the index by examining metrics like investor asset flows, corporate bond spreads, trading volume, and market breadth, to name a few. Think of market internals as your trusted auto mechanic. After you pick out a sharp looking car from the local used car dealer, you might wait to make the actual purchase until your mechanic checks out the engine and gives you the thumbs up. We make our favorite market internals easily accessible and understandable by putting them into a table on our website, as displayed below, and updating it every day. We call them the Asbury 6, or A6. In today’s article, we display and explain two of the A6: ETF asset flows and market breadth. We will highlight and explain the others in upcoming articles for Forbes. The total net assets invested in an exchange traded fund, or ETF, are one of just a few metrics we know of that actually lead price. This is because the inflow and outflow of investor dollars into any financial asset (indicating investor conviction) is the catalyst that actually pushes the price of the asset higher or lower. The black bars in the upper panel of Chart 1 below plot the S&P 500 (SPX) daily since December. The blue line in the lower panel plots the corresponding daily total net asset invested in the SPDR S&P 500 Trust ETF (SPY, which tracks the S&P 500) along with its red 21-day moving average, the latter which represents one business month and is our tactical time period. The red highlights show that the decline in assets below their 21-day moving average between December 6th and January 7th, indicating a trend of monthly asset contraction, coincided with (triggered is more accurate) the 83 point, 3% decline in SPX during that period. 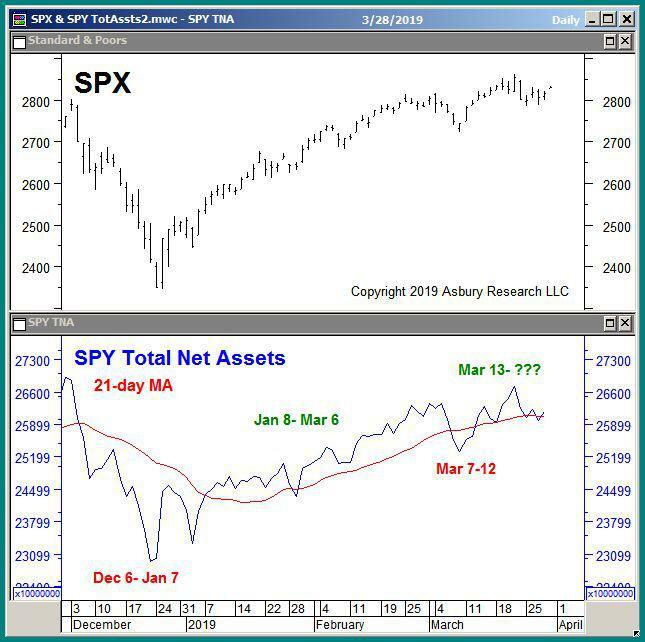 The green highlights show that the subsequent rise in these assets above their 21-day moving average between January 8th and the present, with the exception of a short period between March 7th and 12th, coincided with (fueled is more accurate) the 310 point, 12% rise in SPX since then. This metric identifies when investor assets are leaving the market, indicating a “risk off” situation, and when they are flowing into the market, indicating a “risk on” situation. Market breadth expresses how many, or what percentage, of the constituents of a financial market index are rising in price. There are many different ways to analyze market breadth. 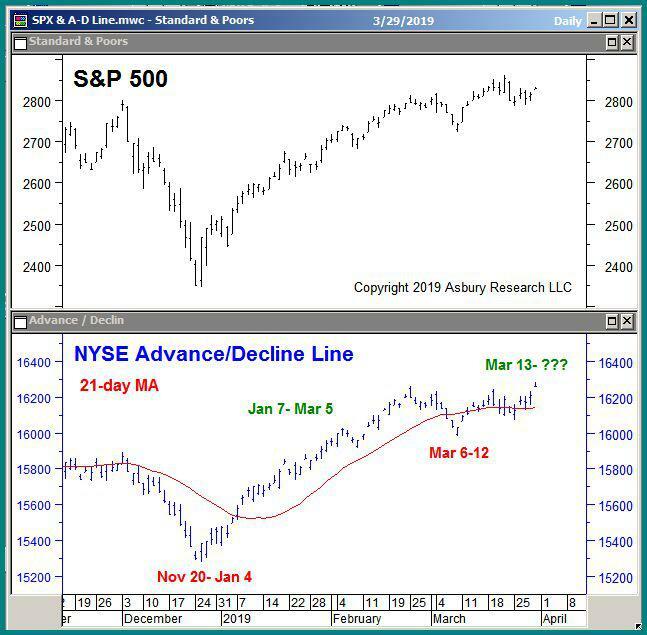 One of our favorites, and one of the Asbury 6, is the ratio of advancing versus declining stocks in the NYSE Composite Index (NYSE), better known as the NYSE Advance/Decline (A/D) Line. The more constituent stocks that are rising within a particular stock index, the better the market breadth and the stronger and more sustainable the advance. Conversely, when more constituent stocks are declining, like when a relatively few larger capitalization stocks are “holding an market up”, the more vulnerable the index is to a bearish reversal. The black bars in the upper panel of Chart 2 below plot the S&P 500 (SPX) daily since November. The blue bars in the lower panel plot the corresponding NYSE A/D Line along with its red 21-day moving average. The leftmost red highlights in the lower panel show that the A/D Line moved below its 21-day moving average on November 20th and remained there until January 4th, indicating a monthly trend of weakening market breadth. This coincided with a 110 point, 4% decline in SPX. The green highlights show that the subsequent rise in the A/D line, above its 21-day moving average to indicate a monthly trend of strengthening breadth between January 7th and the present (with the exception March 6th to 12th), coincided with a 328 point, 13% rise in SPX. Over the past four months, these two market metrics — both independent of the actual index level of the S&P 500 — first warned of an emerging period of stock market weakness in late November, and then indicated an emerging “risk on” environment less than two weeks after the December 26th bottom was established — the latter long before there was any clear indication in the S&P 500 that an “investable bottom” was in place. Some investors might say the 4th Quarter 2018 US stock market decline wasn’t enough to actually motivate them to move money out of the market and, after all, the market came right back, right? But wouldn’t it have been nice to have a little advance notice that the decline — which was 11% just since November 20th — was coming, so you could plan accordingly and not be caught flat-footed? And wouldn’t it also have been nice to know there was an opportunity to put some new money to work in mid January? And what if the decline didn’t stop in late December? After all, this is the tenth year of the current bull market, and a flattening yield curve has been indicating that the prescient bond market has been nervous about the economy for more than a year. Time is the part of investing that can really change everything. If you’re 30 or even 40 years old, the inherent upward bias of the stock market can overcome a lot of problems in your portfolio, over time. If you’re 60, though, a big market decline , or even a bear market (remember those?) — especially if you throw in a couple of ill-advised entries and exits into and out of your portfolio– can drastically change how you live the rest of your life. No one can see the future. However, if you just check under the hood of the market — and you know where to look — you can avoid some serious market breakdowns, especially in the latter part of your financial journey. And you may even find some new opportunities in the process. Our next article will display and discuss two more of our Asbury 6 key internal market metrics. Stay tuned. John Kosar CMT is Chief Market Strategist at Asbury Research LLC, an independent provider of technical and quantitative financial market research to both professional and individual investors. John is also a Managing Principal at Asbury Investment Management LLC, which offers professionally managed accounts driven by Asbury Research investment ideas. I spent the first half of my career on the trading floor of the Chicago futures exchanges, which turned out to be a unique and irreplaceable opportunity to understand how financial markets work from the inside out. This experience, early in my career, became the foundation for my investment research firm, Asbury Research, which I launched in 2005. Its unique blend of technical and quantitative metrics tend to be more intuitive and forward-looking than the typical Wall Street approach. In 2018, after years of being asked by my research clients if I manage money, I co-launched Asbury Investment Management (AIM). AIM brings decades of professional research, trading, and portfolio management experience directly to the individual investor, with a strong focus on risk management. Throughout my career I have been a consistent resource for the financial press, can regularly be seen on financial television, and frequently present Asbury Research’s methodology and investment ideas at financial seminars and events across the country. I was born and raised, and still reside in suburban Chicago with my wife of 28 years, Julie. We have two grown sons, Jack and Brett, and our first grandchild, Sadie Marie, was born in July 2017.